N.E.W. Credit Union Listed as One of the Healthiest Credit Union’s in America! Each year, DepositAccounts.com evaluates the financial health of every National Credit Union Administration insured credit union in the United States – more than 5,600 total. Each institution is graded on a number of factors – including capitalization, deposit growth, and loan to reserve ratios – in order to determine a comprehensive health score. 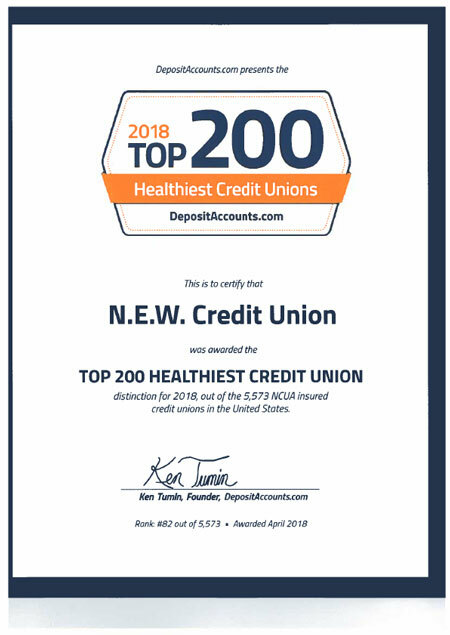 Out of all 5,573 NCUA insured credit unions, DepositAccounts.com recognizes those who have shown exceptional fiduciary responsibility in its 2018 edition of the Top 200 Healthiest Credit Unions in America. For 2018, N.E.W. Credit Union is one of the 200 credit unions nationwide to achieve this distinction! N.E.W. Credit Union serves all who live or work in Brown, Marinette, Oconto and Shawano counties of Wisconsin and Menominee county Michigan.